Review sample provided by HobbyLink Japan. Get your Key to Victory Set 1 there! 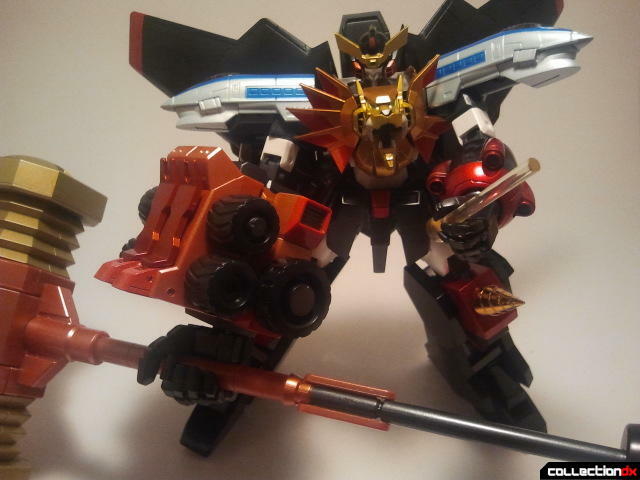 GaoGaiGar is a robot with loads of extra weapons and accessories that make it very difficult to include all of the essentials with the recent Super Robot Chogokin GaoGaiGar. These packs are suitably named the Key To Victory sets, another reference to the GaoGaiGar anime. 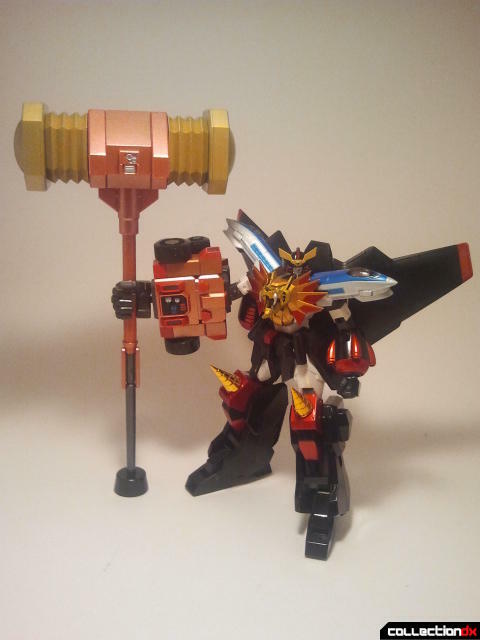 The first set is GaoGaiGar’s most iconic weapon: the Goldion Hammer. GaoGaiGar is an unstoppable force of pure destruction. However, that doesn’t mean is perfect. Under the stresses of performing his final attack: Hell and Heaven, GaoGaiGar’s pilot Guy Shishioh eventually discovers that GaoGaiGar is taking heavy tolls on his body and will eventually kill him. The only solution is an entirely new robot designed by GGG known as Goldymarg: a hotheaded robot that can turn into a tank. However his primary function is as the Goldion Hammer. 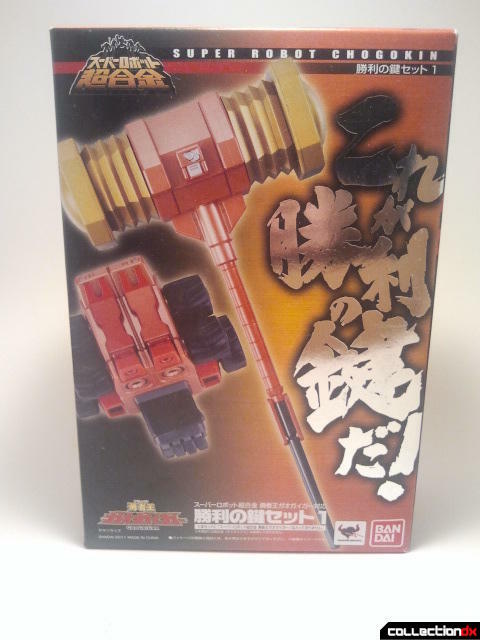 The following toy cannot transform, and is only in Goldion Hammer mode. This consists of a giant fist and a giant hammer. No really, you have to scream it. It’s a requirement of the toy. 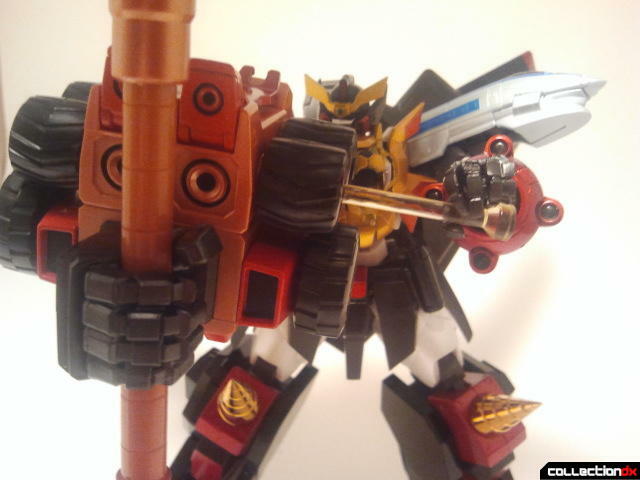 The Goldion Hammer comes with a fist, open hand, and holding hand to mimic all of the different stages of GaoGaiGar’s epic transformation. The Goldion Hammer is an absolutely impressive piece. It adds a huge accessory on top of an already impressive robot. 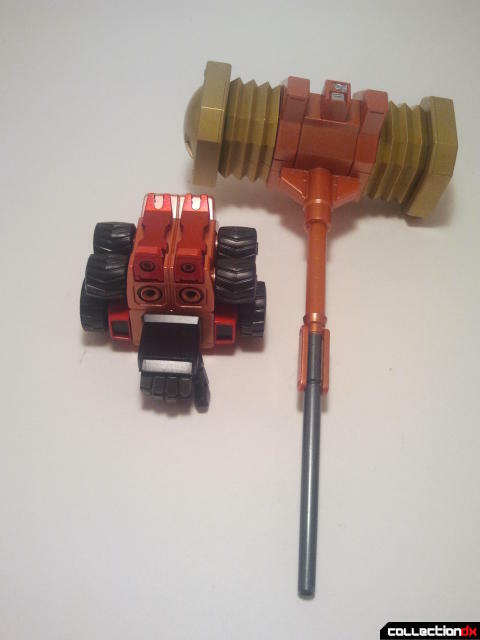 The hammer also extends to become even larger once out of the packaging. Even though the Goldion Hammer is huge and amazing, it’s not perfect. The new arm is incredibly heavy and weighs down on the toy by itself. 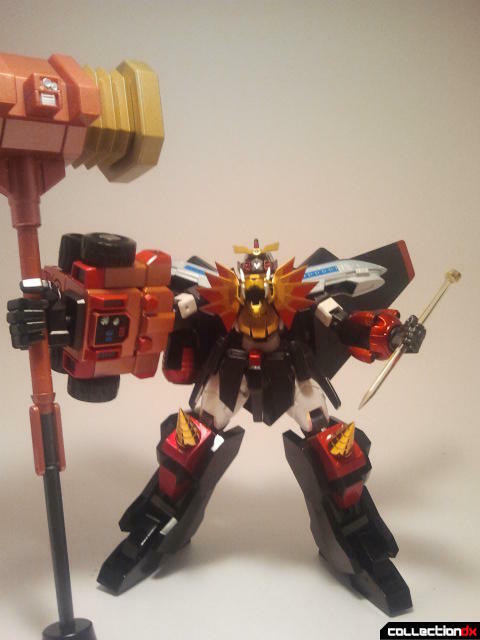 Add the hammer into the mix and it is very cumbersome to pose GaoGaiGar striking down using the Goldion Hammer or doing anything dramatic with it. That doesn’t mean that it can’t be done; it just takes a little bit of work to make it look just right. The Goldion Hammer has a tiny little rubber stop that you can plug into the bottom of the hammer to help hold it in place. It is an absolute necessity to any static poses. 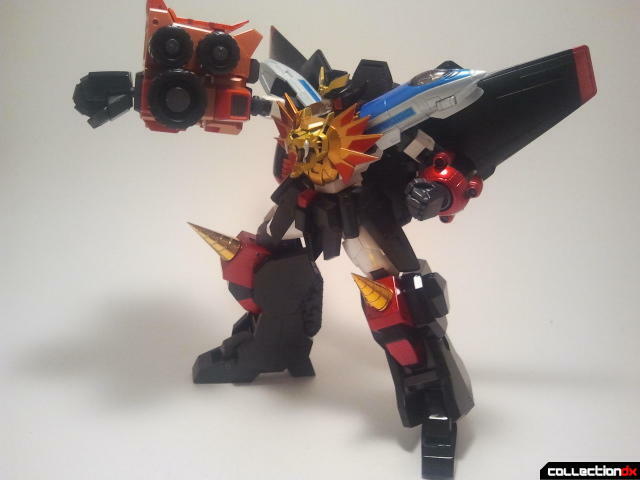 In addition to the hammer and hands, several other accessories are included as well, including two alternate hands for GaoGaiGar's left arm, and also three variations of GaoGaiGar’s nail to represent different moments during the show. You can remove one of the hubcaps on Goldymarg’s tires to peg in one of the nails. 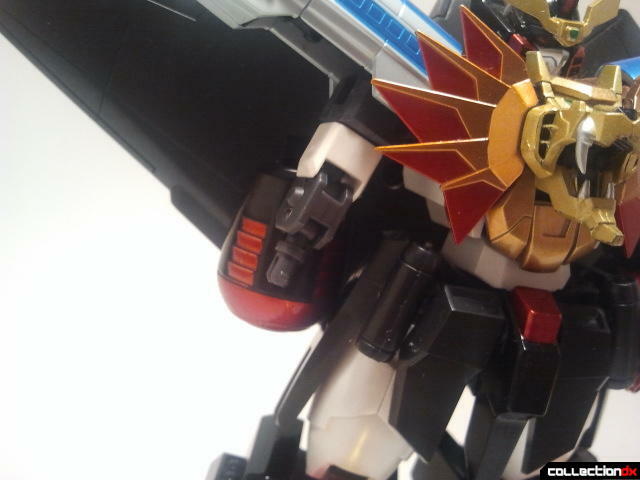 One of the extra hands included can grasp onto this nail as if GaoGaiGar were pulling it out. The alternate hand is used to actually hold the fully extended nail. After that GaoGaiGar screams “HAMMEEEEER HELL!” before jamming the nail into a Zonder. Then while screaming “HAMMEEEEER… HEAVEN!” he uses one of the two front nail removers on the front of Goldymarg’s legs (Which actually move as another point of articulation) and pulls the nail out with the Zonder Core intact. 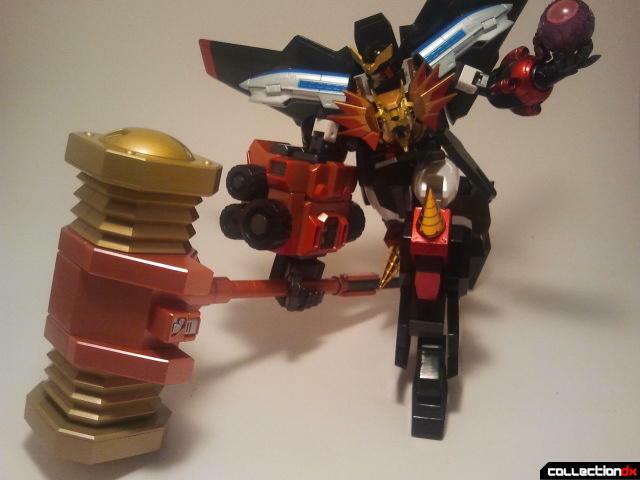 Then GaoGaiGar can use the Goldion Hammer to destroy the Zonder enemies by reducing them to light and saving the day. The Key to Victory set 1 is not perfect by any means. It’s the sort of set that is very difficult to accomplish due to the design’s cumbersome size and overall ludicrousness. The arm is incredibly heavy and the Goldion Hammer itself is very unwieldy. However despite all of those problems, it is still great. 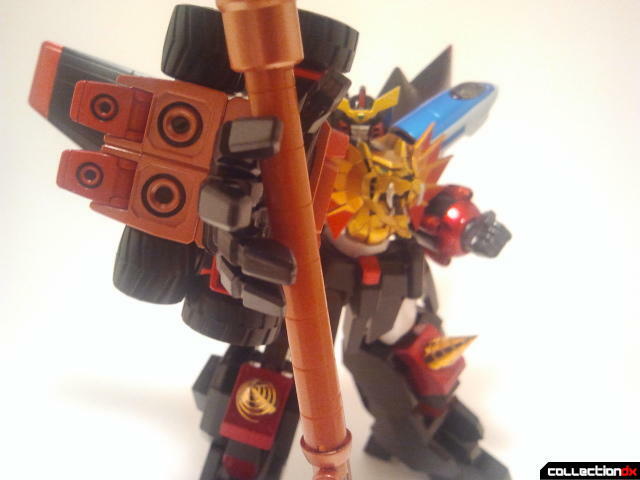 This set is an absolute necessity to the Super Robot Chogokin as one of the most iconic weapons in GaoGaiGar’s arsenal. 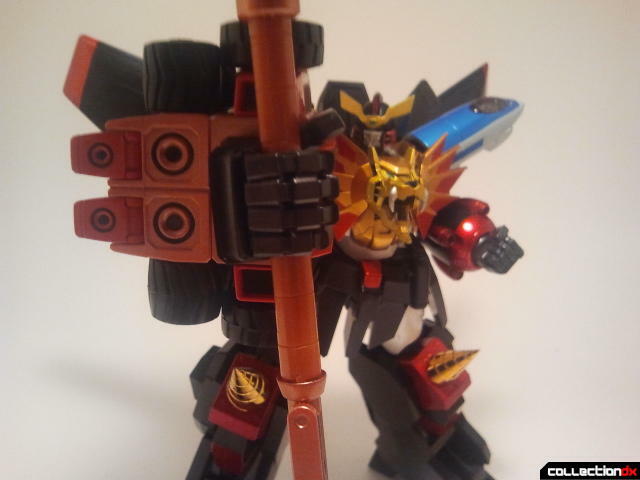 If you have GaoGaiGar, this set is a no brainer and will look fantastic with him. 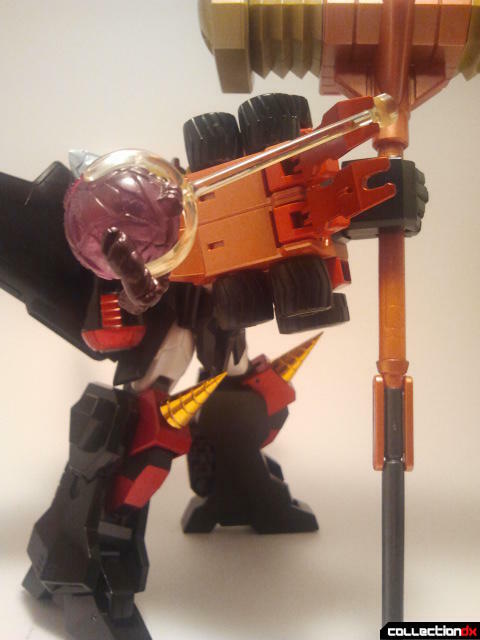 The set is too heavy, it basically turns GaoGaiGar into an unweildy mass of plastic. That said... he is at the front-center of my current SRC shelf, Hammer in hand with the limited edition green swirl at his feet. No one can deny his sheer PRESENCE with that thing, even with more colorful units like the Sentai Mecha and Aquarian Sol competing for your eye's attention. 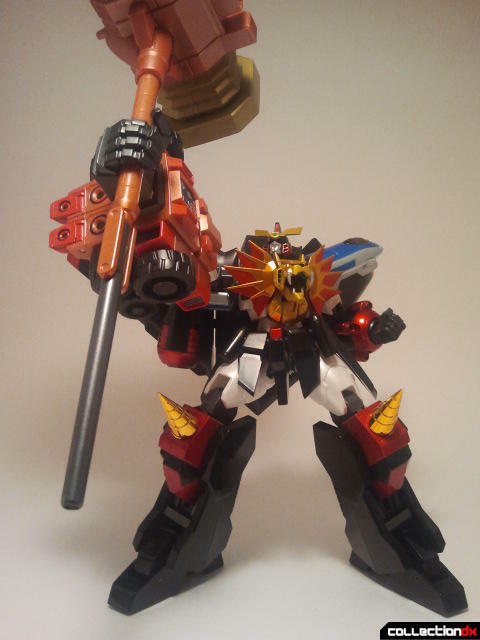 This hammer is so awesome but gods....his joints just cannot handle it. The ONLY SRC that matches his awesome is Magiking. Shame it doesn't fold out to form Golymarg..
2)It's rather heavy...Duh...but I have found a workaround so you can have a static pose WITHOUT the Stopper.